In Physical Optics the topics included are: (i) Interference and diffraction (ii) Dispersion of light and the electromagnetic spectrum. These topics carry 5% of the total points. n = n2/ n1 = λ1/ λ2 = v1/v2 where λ1 and λ2 are the wave lengths and v1 and v2 are the velocities of light in medium 1 and medium 2 respectively]. I = I1 + I2 + [2√(I1I2)] cosφ, since the intensity is directly proportional to the square of the amplitude. xn = nλD/d, where n = 0, ±1, ±2, ±3….etc. where λ is the wave length of light, D is the distance between the screen (on which the fringes are formed) and the double slit and ‘d’ is the separation between the two slits S1 and S2 forming the double slit (fig.). 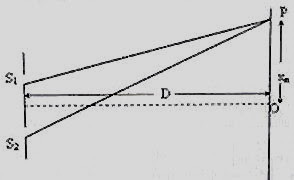 2μtcosr = (2n+ 1)λ/2 where μ is the refractive index of the film, t is its thickness, r is the angle of refraction in the film and n = 0,1,2,3,4,….etc. [A film of negligible thickness cannot satisfy the above condition and hence it cannot appear bright in reflected light. (It will appear dark)]. 2μtcosr = nλ where n = 0,1,2,3,4,….etc. [A film of negligible thickness can satisfy the above condition (for n = 0) and hence it will appear bright in transmitted light]. You should note that Newton’s rings in reflected light are produced by the interference between the light waves reflected from the two surfaces of an air film contained in between a glass plate and a lens . (7) In the diffraction pattern produced by a single slit, the angular separation between the first minima is 2λ/a where a is the width of the slit. The angular width of the central maximum is therefore 2λ/a. The centre of the central maximum is at O (fig.). 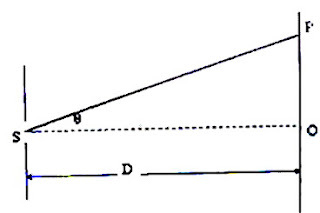 On either side of O, positions of minimum intensity are obtained when the angle θ = ±nλ/a where n = 1,2,3…etc. θ = ± (2n+ 1)λ/2a where n = 1,2,3….etc. Therefore, the secondary maxima are located at θ = ±3λ/2a, ±5λ/2a, ±7λ/2a….etc. The intensity of the secondary maxima goes on decreasing. 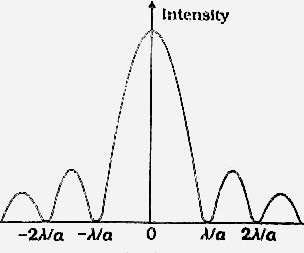 [The first secondary maximum has intensity less than 5% of the intensity of the central maximum]. In the next post questions on wave optics will be discussed. Here is a question which you must be able to work out in no time if you have understood the phenomenon of interference. A student prepared a Young’s double slit by drawing two parallel lines (with a separation less than a millimeter) on a smoked glass plate. [For smoking, the plate was held above the flame of a kerosene lamp]. Accidentally he used two different pins to draw the lines so that the widths of the slits (regions from where smoke was removed by the pin) were in the ratio 4:1. What will be the ratio of the intensity at the interference maximum to that at the interference minimum? Work out the above question. I’ll be back shortly with the solution and of course, more solved questions.